For new parents, choosing a nursery changing table can be a difficult task due to the numerous manufacturers and advantages and disadvantages of each type of model. A popular type of nursery changing table which looks really nice when contrasted against your baby’s nursery is the dresser style changing table. Within this particular category there are generally a few different styles for you to choose from and the great thing about a dresser style changing table is the fact that they allow for sufficient storage of your baby’s accessories within the drawers. The flip top style of dresser changer allows for the largest changing area for your baby, consequently reducing the chances of an accidental fall. There is however conflicting opinions regarding the safety of these flip top units as many people say the weight of the top makes the dresser table unstable. These types of tables are actually far sturdier than the open top example and as already mentioned allow maximum storage space for your baby’s accessories. Perhaps one of the main reasons that many people are choosing a dresser style unit with a flip top is the fact that once you have finished with the changing table, as your baby becomes older you can simply convert it back into a standard dresser without the need to sell it and lose money. 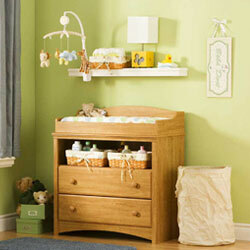 This style of nursery changing table is really popular due to the fact that it quite clearly doubles up as a cot also. There are many designed to save the maximum amount of space within your baby’s nursery and many of these examples also come coupled with convenient drawers to again store your baby’s accessories and goodies. Depending on what type and the manufacturer you choose, some of these models actually allow you to detach the changing table from the cot and will actually save you money if you were to buy these two units separately. How much should you expect to pay for a changing table? This ultimately depends on the type of nursery changing table that you choose and also the particular brand. For a good quality nursery changing table in the UK you should look to budget to at least 100 pounds or more. This will ensure that you get your hands on a high-quality example that usually comes coupled with extended warranties of three or four years and also 30 day money back guarantee, just in case the changing table was not quite what you expected. If you do however have a slightly higher budget to spend on your nursery changing table then there are some wonderful high-quality designs produced by many of the most popular manufacturers in the UK today. South shore Furniture are one particular company who produce numerous models of baby changing tables that look great in any nursery. Remember that some manufacturers supply you with just the base unit only whilst others will also supply you with the essentials such as the baby changing mat and other accessories.